“Papa.” I called out to the complete stranger standing in front of Havana’s Hotel Ambos Mundos on the Calle Obispo. The big man chuckled heartily as only a big man can; the sound originated deep in his barrel chest and rolled forth with the gravity of an ancient cannon being dragged across a stone-flagged courtyard. He was rotund with a big white beard and a theatrically enormous cigar; his embrace was spine-crushing. I dragged him across to the hotel’s entrance for a photograph. 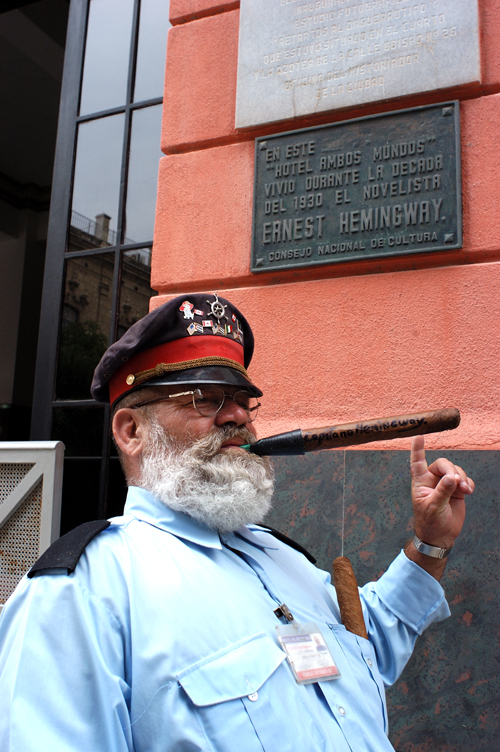 Like many establishments throughout Cuba, the Ambos Mundos trades on its association with Ernest Hemingway and the generously-proportioned impersonator was, in turn, profitably trading off the hotel’s association. It was a symbiotic relationship of the type that drives tourism all around the world; in this case, it added a little extra frisson for the tourists. Hemingway is big in Cuba. Throughout the 1930s, when Hemingway was rolling towards literary immortality following the enthusiastic reception of The Sun Also Rises, he was a regular visitor to Cuba. Invariably, he would stay at the Ambos Mundos, close to all the bars, restaurants and nightclubs he tore through like a tornado. Room 511, on the front corner of the building, with a balcony looking up the Calle Obispo to the Plaza de Armas and the waterfront beyond, was his favoured room and it has been turned into a shrine to Hemingway. It is recreated for the period when Papa called it home, down to its plain single bed, typewriter and various personal effects. The entrance fee to the museum is two convertible pesos, equivalent to about $US2 which was the amount Hemingway paid per night for his room. The hotel publicity claims he wrote Death In The Afternoon and The Green Hills of Africa in that room. 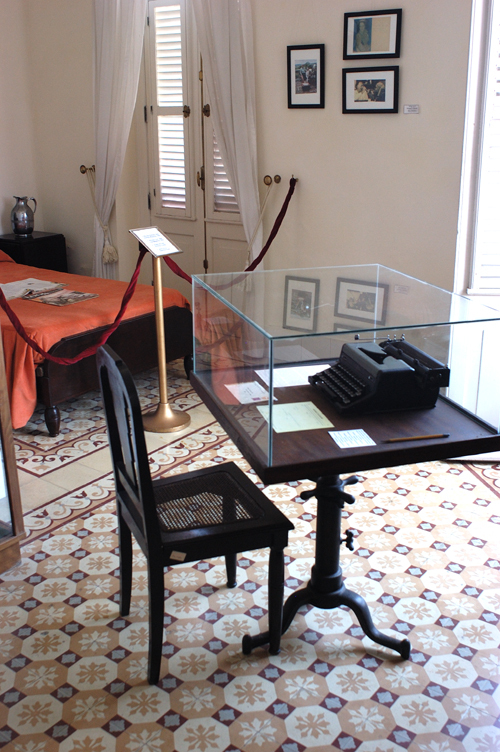 Subsequent books would be written at Finca Vigia or Lookout Farm, a property he later purchased outside Havana and which has since become Hemingway Central for his fans, part museum, part national shrine. Reminders of Hemingway are everywhere in Havana. At the other end of the Calle Obispo is the Floridita, a bar and restaurant that lays claim to inventing the Daiquiri; Hemingway, ever the shill for his own legend, preferred a double-shot of the cocktail. In between, in just about every street and narrow laneway, there’s some reminder of Papa, no matter how obscure. Later in life, Hemingway would drink to mitigate the pain from two plane crashes he had endured in Africa. When he was young and virile, he drank because he enjoyed it and it complemented his burgeoning reputation. It was what men did and Hemingway fashioned himself as a man in a world that was becoming increasingly marginalised. Cuba’s adoration for Hemingway straddles the cultural chasm between the man and the legend. Hemingway the man loved adventure, world travel, his many cats, his numerous dogs, drinking, and women, not necessarily in that order. Hemingway nurtured the myth in his own lifetime and it has flourished in the decades since, in the silent early hours of a gentle summer morning, he took his favourite twelve-gauge Boss shotgun onto the porch of his cottage in Ketchum, Idaho, and consigned himself to legend. No-one in Cuba talks about the old Hemingway, his creative waters muddied by old injuries, half blind and rattled by electroconvulsive therapy. To Cubans, he is a folk hero, a man shaped by the magnetic attraction of heroic bravado and superhuman appetites. He represents the Latin ideal of machismo and it fits well with the Cuban love of life – to live heartily, love with no regret and damn the consequences. Hemingway would have approved. I love this post! I am a huge Hemmingway fan, and strangely just finished watching the movie made from his book “Garden of Eden”. I would love to visit Cuba, sit in a bar where Hemmingway did, and write just for the hell of it! Thanks for the wanderlust! Great, great, great post! Hey Ashley. Thanks for dropping by. Love your site as well. Cuba is the most remarkable place – as you can tell with three posts so far. Sooner or later, I’m going to have to do one on the cars. I just wanted to let you know, I am looking at flights to Cuba next May because I’ve been thinking about your posts! So seriously, thanks for posting these wonderful articles on Cuba! Ashley – Great to hear. You’ll love it and look forward to reading your impressions. I still have a few more posts to go on Havana. It’s just such a magical place and it stays with you long after you’ve left. Keep up the good blogging. I love your stuff. Great story….good to read a less romantic and more real view of the great man! I have sent you a link to a little known Hemingway work you might enjoy.